New technologies have never moved so fast. In this demanding and increasingly complex field, the initial training of IT professionals is no longer sufficient: an increasing proportion of them are choosing to pass professional certifications in order to guarantee a standard of competence and to give boost their career. Looking for help in your IT career? Certification is the norm for the majority of medical workers, teachers, accountants, pilots, engineers, managers and marketers, drivers – and this requires rights that are issued on the basis of exams. Some programs include scrupulous internal examinations, which can last more than one day. Certification in the field of IT can be the best way to quickly gain valuable skills and demonstrate a deeper interest in the field that will contribute to your career. Professional certification today is an integral part of the development and testing skills in IT industry. IT market, is a wide rapidly growing sphere that includes a number of components such as management, communication, software, networking, security, etc. The need to simplify the process of finding the best specialist suitable for the opening position created conditions to set standards that would measure candidate’s skills. That’s how certifications began to be valuable in the modern world and become an advantage. The most popular vendors that provide IT certifications are Cisco, Microsoft, CompTIA, VMware, EC-Council, Oracle, IBM. 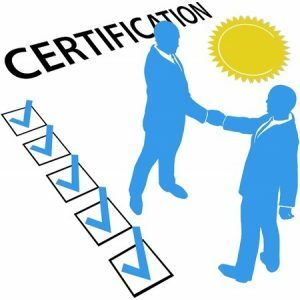 It should be understood that the process of getting certification is a mutually beneficial process of an individual and a vendor. IT certifications have several advantages. Why do I need certifications in IT and business when I already know how to do my job? Well, there is no secret that most people use certificates to differentiate between job seekers who are otherwise qualified at the same time. It is about remaining competitive within the market. IT certifications, in particular, are highly valued by employers looking for IT experts. Some companies and organizations require that job seeker have particular certifications even to apply for certain positions. In this technologically driven world all businesses are evolving and moving to the cloud and are adopting cloud-based technology. The usage of this technology is rapidly growing among large and small businesses alike. If you want a new job with extra pay then Cloud Computing Certification would be a great option. Security threats have been on a rise lately and many organizations are facing the brunt like never before. Systematic hacks of company resources have been on rise which makes cyber security skilled professionals availability highly in demand and a good field to launch your IT career path. This has made the security talents need to increase for functionality, however the skills shortage continues. This is one of the reasons that the demand by companies for security certified individuals is going to lead to make path for a high salary for certified IT Security Professionals. Networking connects devices in such a way that they can transmit information Networking is a very important piece of an infrastructure and there are positions in networking sphere that are constantly in high demand. To be a real professional in your career in networking field and t be competitive in this field, one should get a certification (in the area one chooses) and to stand out in the rapidly growing IT market. The Project Management Certification is highly demanded and valued by almost all organizations around the world. The profile of a project manager involves the ability to set rules and discipline during project implementation. Competent planning, managing, completing and checking of the project by dedicated individuals is the manager’s direct responsibility. This certification prepares you for this competence and provides you with the most actual and progressive management methods that are necessary for effective implementation of the project. Being a professional, working in IT and seeking for career prospects, means that Data Science Certification is what you need to open the doors in your better future. The certification is the first and premier thing that you should focus on. The need for Data Analytics has skyrocketed. Having this certification makes you competitive on IT market among other candidates and testifies your skills to solve data problems. In the electronic era still there is a lack of certified professional digital specialists who have profound knowledge in Digital Marketing sphere. Having a Digital Marketing certification is a must for being a profi in this area. Obtaining this Certification helps to raise your business to a higher level and creates conditions to market products online. It should be pointed out that the salary of the certified profession is higher than of an ordinary specialist. That’s why candidates take exams to differentiate themselves from the rest, to get or update skills and get career prospects in a company. Hiring certified professionals are also useful for employers. 44% of the IT professionals interviewed say that certification leads to a faster performance of employees, 33% said that this leads to greater efficiency in the implementation of systems, and 23% say that it helps to present products and services faster with less number of errors. To sum up, IT market takes up a significant place in any developed economy. As certified IT professionals, their skills and experience, projects they implement nowadays are very important for economy sector of each country, the work they do is meaningful to the development of the society. Certifications are now a complementary and necessary part for IT professionals, seeking for a good job. Having a certification guarantees that the certified professionals of IT know exactly how to offer a satisfactory project. In addition, obtaining the IT certification helps you as an IT professional to achieve credibility with your company and above all with the IT sector, makes IT professional more competitive in the labor market and helps to get better positions in the company. That explains why most companies that offer IT services require to have certified and highly qualified personnel.